Picture of one of our boards on the beach in Grand Cayman. The customer service is also fantastic. They will answer your calls and reply to your emails very quickly. The helpful and friendly team makes renting a paddle board fun and worth it. The helpfulness of the team is superb when you are organizing pick-up and delivery times of the paddle boards. It also makes learning how to paddle board easier because they are willing to take the time to explain the technique to you. It is very easy to learn so the lessons are short and concise, thus ensuring that you get the most time out of your rental. You do not need much experience in kayaking, canoeing or rowing to be able to paddle board. It is very easy to learn any one can do it. Initially one needs to learn how to balance on the board, but with a little practice you will be able to paddle board with no problems. The speed in which you can learn how to paddle board makes it fun and accessible to everyone, therefore should be done at least once during your vacation. However, it is encouraged to have a minimal level of fitness because it does involve physical effort, but you can tailor how far you go depending on your own fitness level. 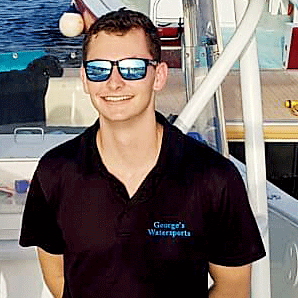 It is very safe to rental a paddle board with George’s Watersports. The boards are very well maintained and have been imported from the USA, so are very good quality. We also deliver to 7 Mile Beach. Life vests are provided and you can be provided with a demonstration on how to use the boards if you have never paddle boarded before. We are a paddle board company that has the highest quality boards. 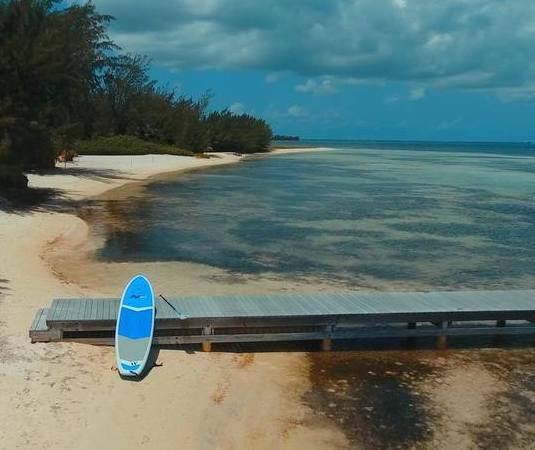 Therefore, this paddle board rental service is the best option on Grand Cayman and perfect for your holiday. Most companies and businesses offer low grade boards. Our company also has free delivery. Children can also use paddle boards, thus making them a suitable activity for families of all ages. Paddle boarding is an environmentally friendly activity because it does not require a motor or any fuel to use. The board is similar to a surf board, but slightly wider, so makes balancing easier. We are the most reliable paddle board operator on island. The paddle is like an oar of a kayak and you have to then paddle yourself forward. Therefore, there is no engine or need to buy fuel. This keeps the costs of paddle boarding to a minimum and is a cheaper alternative to renting a boat. It is also fantastic to spend time on the sea knowing that you are not harming the marine environment. Stand up paddle boarding Grand Cayman is a form of sustainable tourism and is highly encouraged to participate in when you visit the island. Paddle boarding is great exercise. You can either stand on them or sit on them. It is possible to rent more than one so your whole family and all your friends can rent them during your stay. Paddle board yoga in the Cayman Islands is a new popular trend, which you can try out if you rent paddle boards. It can help you perfect your balance and improve your fitness. It is very peaceful to do yoga on a paddle board in the middle of the Caribbean Sea. It is a very surreal experience and perfect for those who want to feel like they are at one with nature. Many people enjoy paddle boarding up and down 7 Mile Beach because they have a fantastic view of the beach and the island from the sea. The sea on Seven Mile Beach tends to be very calm and does not have a strong current, thus making it an easy place to paddle board. Our SUP boarding business is to make sure you have the best possible experience. If you are renting the board at another part of the island, that too is still a beautiful experience. Most people enjoy sup rentals due to the uniqueness of the experience. It is always fascinating to see the island from the sea and renting a paddle board allows you to do this at your own pace and leisure. While paddle boarding, it is also possible to see marine life from the paddle board. The sea is crystal blue and very clear in Grand Cayman, so you can spot many kinds of tropical fish, birds and sometimes turtles. Sometimes people tie up their paddle board so they can then go snorkeling off the side of the board. This allows them to see all the fish without disturbing them because paddle boarding is quieter than driving a boat. So, don’t miss out and use the opportunity to rent a paddle board!